Two restaurants for this trip were identified from food/travel based TV. shows. The first trip to Hot n Juicy Crawfish was disappointing on several levels and I was worried our second cab ride far off the strip would turn out to be a bust as well. 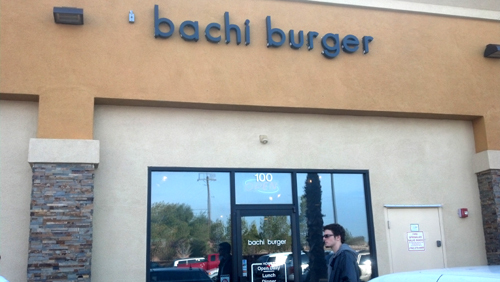 It seemed everyone who has visited Bachi Burger on one show or another has had a positive and visceral reaction to the place, so I held out hope. Turns out they were nearly perfect…the single flaw would prove to be expensive. If The Drinks Are This Good And Strange, Where Do We Go From Here? Up. The interior of the place which has garnered a great deal of attention for infusing Korean flair into the all American sandwich is neat, clean and busy. There is apparently always a wait and with all of the out of state plates in the lot it seems to be working on becoming a destination restaurant. Not bad for a burger place. We were decoding the menu and had ordered a couple of unique drinks first. 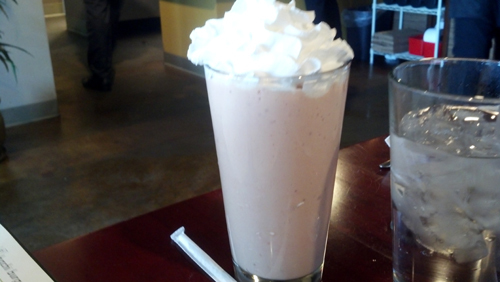 The Strawberry/Guava Milkshake was stupendous. 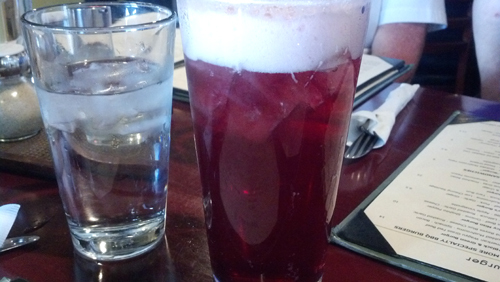 The cherry/yuzu soda was every bit as good. I was beginning to feel as though I would be redeemed for Hot n Juicy. The beverages were so good we ended up ordering a third just to see and were rewarded with a lightly sweeter but still unique and delicious Apple Lychee soda. The first volley was set to “shock and awe”. That's the milkshake to the left. I do love guava. It only got better. We ordered the Oxtail Chili Cheese Fries. I thought this would be an interesting comparison to my favorite dish from The Public House, the Poutine. 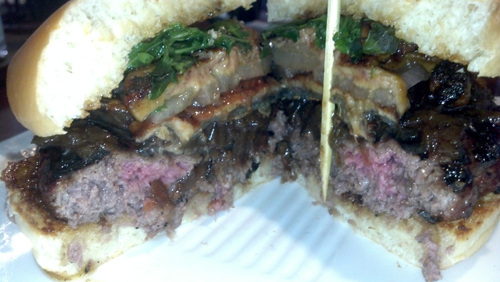 Bachi Burger beat it hands down. 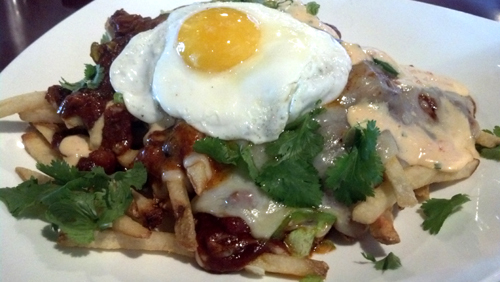 Succulent oxtail chili, cheese, crisp fries, garlic aioli, greens, raw jalapenos and a fried egg. What sets Bachi’s apart is the variety of taste buds affected. While rich goes so far, this pile hits every note with sweet, tangy, spicy, salty, umami and on and on. This stuff was magical. 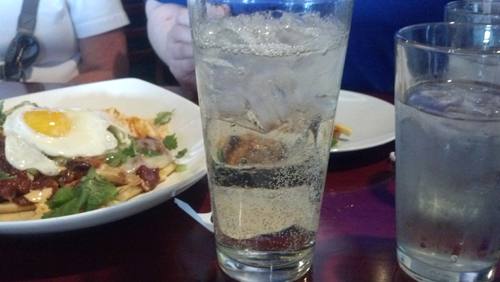 Have You Ever Seen Hot Pepper Water As A Condiment? Not Me. We ordered three burgers. The BBQ Bachi simple, the Banh-Mi and the Shogun with a couple orders of fries. Bachi is short for Hibachi, the style of grilling. Even with veggies and simple cheese, mustard and ketchup there is something special about the sandwich at Bachi. 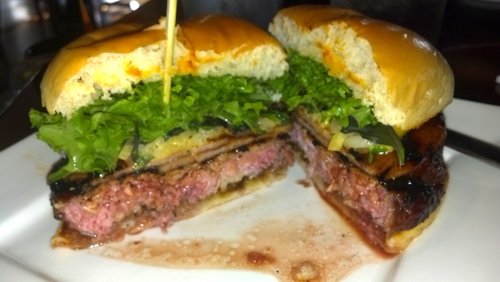 Then you get to the heart of the matter…things I would not have expected to order on a burger but am so glad we did. Steph had the Banh-Mi with angus beef, pork, shrimp, lemongrass, pork pate, fresh herbs, curry aioli, pickled vegetables and a cup of Nuoc Mam sauce. There is no describing how these things work together unless you have tried it and then you know. Collisions of flavors combining to create entirely novel experiences. Plus a dank, sweet and sour sauce to completely change everything, it makes you long for a trip to the far east. Super Flavorful Banh Mi Burger. I Loved It. But Was The Only One Comfortable Eating It. Shame. I ordered the Shogun Burger and everyone had a taste. I didn’t get too far into what was between the buns with my fellow diners but let’s just say ridiculousness is movin on up. 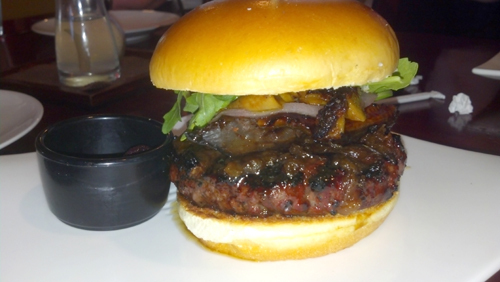 A Wygyu beef patty is topped with pan seared foie gras, poached asian pears, miso butter and unagi. That’s right eel. There is also a little cup holding a single tiny yamamomo peach. If the flavor profile of the Banh-Mi defies description this thing is far beyond my vocabulary. Sweet grainy pear takes on notes of wine, terrifically fatty patty is exponentially bolstered by the foie, salty and earthy miso butter transforms the chewy fishiness of the unagi. It shouldn’t be good and it’s not. It’s stupendous. 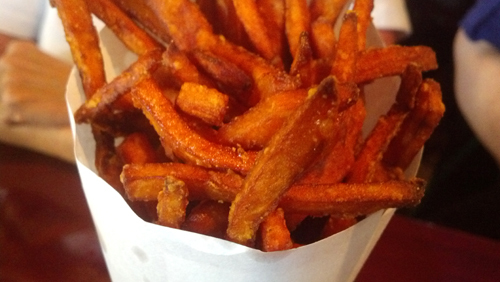 We ordered Sweet Potato and Truffle Parmesan Fries. Both were again more than expected. The sweet potato fries were dusted with sea salt and served with a lively yuzu citrus aioli for more unique pleasantness. 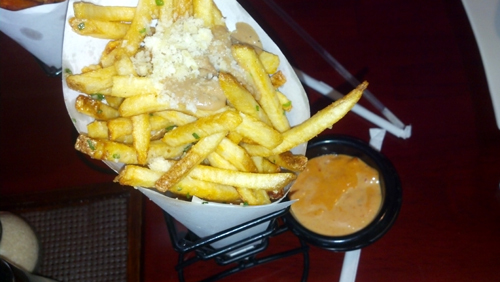 The truffle Parm fries were even more epic. Rather than fries tossed in a bit of truffle oil we received crispy fries tossed in Parmesan Reggiano cheese and dosed with a healthy squirt of Périgord truffle and Porcini mushroom cream sauce. 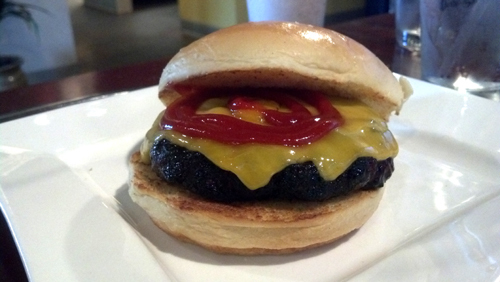 Add a cup of sun dried tomato aioli and the hits just keep spinning at Bachi Burger. Finally, the mistake. 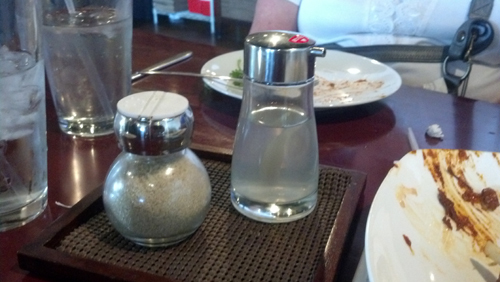 No matter how the burgers were ordered, they arrived at a definitive mid-rare. I don’t mind a less done burger from a reputable house but my dining companions are not as comfortable. There are three common reasons for this. 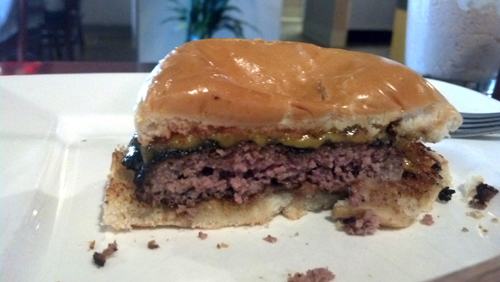 The kitchen is busy and pushing too hard to leave the burger on long enough, the cooks can’t correctly temp a burger and I know more than my customers about how burgers should be done. All three are unforgiveable. I was excited about trying the Portuguese doughnuts or the seasonal fruit pop tarts but the mood around the table changed as folks started to scrape around the burger patty to study the rosy pink interiors. 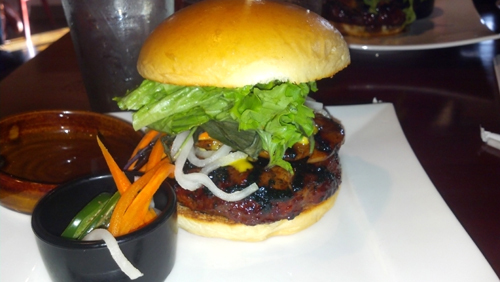 Bachi Burger was the best meal we had this trip and definitely ranks high in all of our trips. A lack of fundamentals (AKA simple, stupid, careless mistakes), however, keeps them from replacing the big boys.